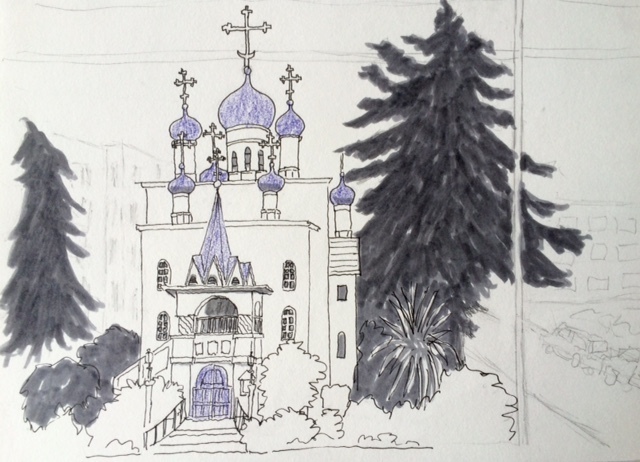 Waking up to the sound of rainfall, I wondered if it would dampen the spirit of the Seattle Urban Sketchers ad hoc outing to St. Spiridon Orthodox Cathedral this morning. Undeterred, several sketchers showed up ready to go. Later, everyone had something interesting to share. The rain diminished leaving cool temperatures and overcast skies, a perfect situation for open air sketching on a city street. The blue onion domes of St. Spiridon Orthodox Cathedral are a unique feature of the South Lake Union district in Seattle. 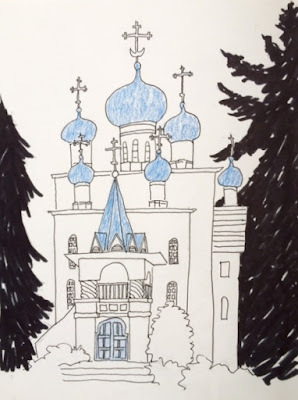 Reminiscent of Russian churches I’ve seen in illustrations and photographs, it’s a reminder of cultural heritage often forgotten by descendants of immigrants. Mesmerized by the complexity of the facade, domes, and crosses, it took me a bit longer than usual to lay down the composition. My concept was to draw the cathedral in the style of a Russian icon, facing the building head on, using a strong contour outline. Built in 1941, now sandwiched between modern apartment buildings and workplace towers, the cathedral offers an extraordinary contrast to the surrounding minimalist contemporary architecture.